The FLIR Airtec Diesel Particulate Monitor is a wearable monitor to help protect miners and other at-risk workers from overexposure to diesel exhaust fumes. 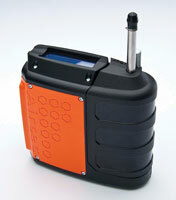 It is lightweight, portable and has a large LCD screen with backlighting. The easy-to-use, self-explanatory interface gives workers access to real-time results. The monitor has a battery life of greater than 12 hours of continuous use.